Today with the development of mobile technology many business operations become less manual and more efficient. 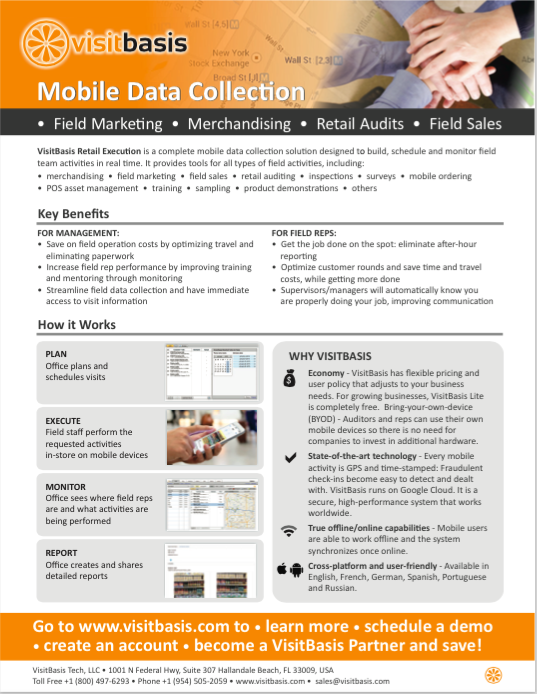 Field sales, as activities that take place outside the office, especially benefit from mobile data collection tools. Mobile device implementation and mobile access to corporate data allow field reps to work from everywhere, which makes field sales an increasingly affordable option for CPG companies. Companies adapt mobile technologies into sales process to enhance productivity and improve the bottom line. Paperless order taking significantly reduces the costs of data collection, shortens sales cycle, and motivate sales reps by making their job more rewarding. To make sales process a breeze, VisitBasis offers companies an all-in-one mobile application for field sales designed to manage, schedule, and monitor field team activities in real-time. VisitBasis field sales application is the ultimate way to overcome such challenges as enlarging customer base and product catalog, expanding field sales force, and dealing with higher customer expectations and increased competition. The VisitBasis field sales application provides in-store photo tasks, audits, surveys, out-of-stock, ordering, price checks and more instruments to maintain efficient data workflow between sales team and the managers. VisitBasis Field Sales uses the latest mobile technology to maximize the efficiency and effectiveness of order taking process: sales reps can place product orders and returns using their tablets and smartphones, and managers are able to monitor field activities in real time. 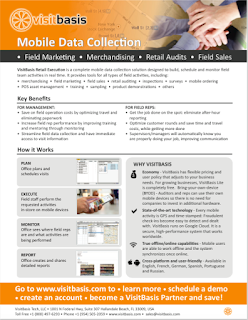 VisitBasis Field Sales is a complete, real-time solution for field service-based companies that allows managers to optimize each stage of sales management, including assigning sales territories, scheduling retail visits, developing mobile data collection templates, monitoring of sales reps in the field, getting information from retail locations and analyzing sales performance. Whether you are a small or large retail company, new technology for field sales management can greatly assist in making the management of your field sales teams less complicated. Field sales automation can instantly improve your sales reps’ productivity and boost sales. Sign up today at www.visitbasis.com to move your field sales to the next level free of charge.